This page is designed to give the reader an overview of the background to Ireland’s complicity in human rights abuses in Colombia surrounding the notorious Cerrejón coal mine. Ireland’s semi-state electricity company, the ESB, purchases Cerrejón coal for energy production in its Moneypoint power plant. Furthermore, Cerrejón’s sales branch, the Coal Marketing Company (CMC), has its headquarters in Dublin. Throughout the briefing you will find links to further reading, including Irish and international media coverage of the issue. The Cerrejón coal mine is the largest open-cast coal mine in Latin America, and one of the largest in the world. It covers 690 square kilometres in the Colombian department of La Guajira, in the north-west of the country bordering Venezuela. Its size is nearly equivalent to 100 Phoenix Parks. The mine has been in operation since 1985, and exports 32 million tonnes of coal per year. All coal extracted in the Cerrejón mine is exported, with Europe as the main consumers. It has changed ownership over the decades, and is now owned in equal share by the multinational extractive corporations Glencore, BHP Billiton and Anglo-American. Cerrejón has displaced around 35 indigenous, Afro-Colombian and ‘campesino,’ (small scale farmers) communities throughout its 33 years in operation. Only five of these communities have been ‘resettled,’ a process whereby communities have been moved to urban areas with the promise of housing, water, small financial aid, and education scholarships. In practice, these provisions have been wholly inadequate. Resettlement has been explained by Cerrejón as necessary for the protection of local communities’ health and safety. However, communities have no choice as to whether or not they wish to move, or to stay in their territory – land which they have occupied for hundreds of years. 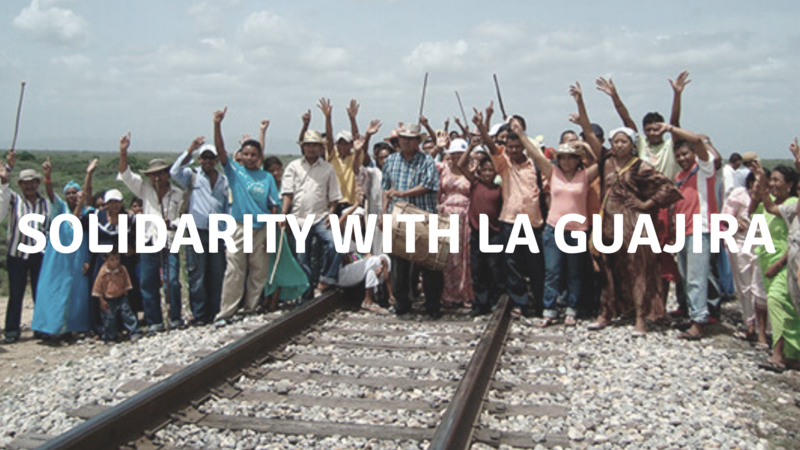 Communities’ livelihoods in La Guajira are acutely vulnerable to disruption from Cerrejón’s operations. Severe drought has led to the death of 20,000 of the region’s cattle in recent years. Communities resettled to urban dwellings struggle to find employment, and do not have sufficient land access to maintain their subsistence way of life. La Guajira is a semi-arid to arid region, which depends on two rain seasons for freshwater supply. The main source of freshwater in La Guajira is the Ranchería river, and many communities in the area rely upon its tributaries. Cerrejón has been accused of drying 17 of the tributaries of the Ranchería river. In 2016, the company publicised their plans to divert 26km of the Bruno stream, another tributary of the Ranchería, to access 500 million tonnes of coal lying beneath the riverbed. The company consulted only one community prior to commencing the diversion project, despite the fact that twelve communities rely directly on the Bruno stream. In 2017, the Colombian Constitutional court ruled that the diversion of the Bruno stream must be halted until all affected communities had been consulted. However, Cerrejón proceeded with diversion works in direct contravention to the court ruling. Shipia Wayúu, an indigenous Wayúu organisation, reported that 4,700 Wayúu children died of hunger between 2010 and 2015. A more recent study commissioned by Human Rights Watch found that 81 indigenous children died of malnutrition in La Guajira between January 2016 and August 2017, at a rate of roughly one every week. Many indigenous children in La Guajira are dying of malnutrition. The government and the media say this is because indigenous Wayúu parents are bad parents who let our children die because we don’t look after them. But if the environment wasn’t polluted and there was work, our children wouldn’t be dying of malnutrition. Moneypoint, Ireland’s only coal fired plant, relies entirely upon imported coal to create electricity. Over 90% of coal imported to Moneypoint since 2011 has been sourced from Colombia, predominantly from the Cerrejón coal mine. The ESB are a semi-state company, and given that the Irish government owns 95% of the ESB’s shares, this means that Irish taxpayers’ money is being used to buy coal from the Cerrejón mine. Overall, coal contributes to approximately 14% of Ireland’s overall energy mix. However, recent investigation revealed Moneypoint was out of action for several months in 2018, and as many environmental groups pointed out, the country did not suffer energy shortages. Importing and burning coal at Moneypoint also has detrimental effects on Ireland’s local environment, such as ash blowing onto local fields, and smoke pollution (there were 17 breaches of Moneypoint’s pollution licence in 2010). It is also a significant contributor to global greenhouse gas emissions, with 4.5 million tonnes of carbon dioxide emissions in 2015 alone. Ireland already contributes disproportionately to carbon emissions compared to other European countries, and will face considerable fines from the EU by failing to reduce our emissions sufficiently by 2020. However, phasing out coal cannot be based on an economic argument alone; the very real impacts of coal mining on human lives and collective human rights of communities in La Guajira must be recognised as sufficient imperative for halting the import of Cerrejón coal into Ireland. The Department of Communications, Climate Action and the Environment has stated that Moneypoint will begin to close in 2025. There have been no concrete proposals from the Department about what will replace the energy current produced by Moneypoint, nor sustainable job proposals for employees. While it’s clear that Ireland is under obligation to phase out coal and to reduce greenhouse gas emissions urgently, this transition must be just – it must include provisions for safe employment for Moneypoint workers (A just transition for La Guajira is also necessary -Cerrejón mine workers must not be left without clean jobs when the mine closes). The Irish government has acknowledged the human rights abuses associated with the ESB’s supply chain; however the government has yet to take a formal stance on the current situation. The government has pledged to contribute €5.73 million to the Global Environment Facility Trust Fund (GEF), to aid developing countries respond to climate change. Yet, Ireland is directly sponsoring climate chaos, environmental destruction, and human rights violations through its continued reliance on Colombian coal. Furthermore, although Ireland has contributed €3 million to an EU Trust Fund in support of the Colombian Peace Process, importing coal from Colombia directly undermines Irish solidarity with the peace process. The Global Witness Report in 2016 featured a case study on the indigenous Wayúu people in La Guajira, who have experienced harassment and death threats as a direct result of their resistance to Cerrejón’s coal extraction practices. Ireland cannot therefore stand firmly in support of the Colombian peace process whilst continuing to import coal that fractures Colombian communities and their ways of life. Ireland was recently lauded as a leader on climate action by becoming the first country in the world to divest from fossil fuels. However, coal is the single biggest global contributor to climate change. By importing coal from the Cerrejón mine, the ESB is not only knowingly contributing to dangerous climate change, but is supporting a company responsible for decades of human rights violations. LASC and other Irish human rights and environmental organisations are calling for the Irish government to stop the purchase of Cerrejón coal on human rights grounds. However, our work must not stop there. Cerrejón has license to operate until 2034, but one of their key shareholders, BHP Billiton, stated at the company’s recent AGM that there is enough coal in the region to continue extraction practices for another 100 years. Ireland must call on Cerrejón’s owners to provide adequate compensation to affected communities in La Guajira and formulate a coherent closure plan that includes a just transition for mine workers. Ireland’s and other European countries’ purchase of Cerrejón coal illustrate a global economic model that sees richer nations benefiting from cheap energy production in more impoverished nations, at a huge cost to human welfare and the environment. The nations who consume Cerrejón coal contribute to locking La Guajira into an unsustainable economy, along with the impacts of numerous human rights abuses on local communities. Given that the mine will continue to extract coal beyond any possible Irish divestment, we have a responsibility to stand in solidarity with affected communities and support their demands for access to their basic rights and resources. Furthermore, Cerrejón’s global sales company, Coal Marketing Company (CMC) has their main office in Dublin. It’s well known that Ireland through its corporate tax regime has become a popular destination for multinational corporations. We consider this to be a second way that Ireland is complicit in the broader injustices of the Cerrejón operation. To join the regular campaign meetings, keep an eye on LASC’s newsletter (sign up on LASC homepage), Facebook and Twitter for meeting dates.